After carrying a 5" kimber 1911 for nearly 20 years I'm ready for something not so damn hefty. I prefer the trigger of the kimber 1911 but damn there are no officer sized pistols for a reasonable price that I've seen. Any suggestions? Light with reasonable capacity Sig P365. I believe that all the bugs have been beat out of that to where it's basically a gen 2 model now. Ours has been perfect. The trigger is really really nice. Second really light but less capacity would be M&P Shield in 9mm. Steve, 2015 Mustang EcoBoost Premium with Nav on factory 20s. Magnaflow Catback, MMR Intake. 97 C5 Corvette not stock. 06 Ford F350, PSD, CC, LB, 4x4. 02 Ford Taurus DOHC. 88 Suzuki Samurai. I have a Sig P320 carry (9mm) and a Ruger LCP (380) that I carry. Why not take a look at the Kimber Micro 9mm that gives you the ergos and I believe the great trigger of your 1911? Smith & Wesson SD40VE is my choice of carry weapon. I purchased mine, brand new, for $289 when they first came out. I believe they are going for about $389 currently. It does also come in 9mm, the SD9VE. The only thing I didn't care for is the 2-piece trigger, and there is a kit that is easily installed. The slide has nice serrations on the front and rear for quick engagement and target aquisition. I'm considering one of those as they are cheap and light weight as well. I want a an officer 1911 or kimber raptor but man I just don't see spending 700-1100 on a small carry pistol even if I don't care for the triggers. I carry an XDS 45 or a S&W 9 Shield. Debating getting an FNS compact. i have a taurus pt738. i got that because it has a larger trigger guard than the ruger does, and it is a neat little gun. I also carry a shield 9mm. I’m 6’2 and it fits me well. +1 on the Sig 365. I carried a Kimber Tactical Ultra II for many years and still do sometimes, but really liked the Sig 365 and Glock G43. 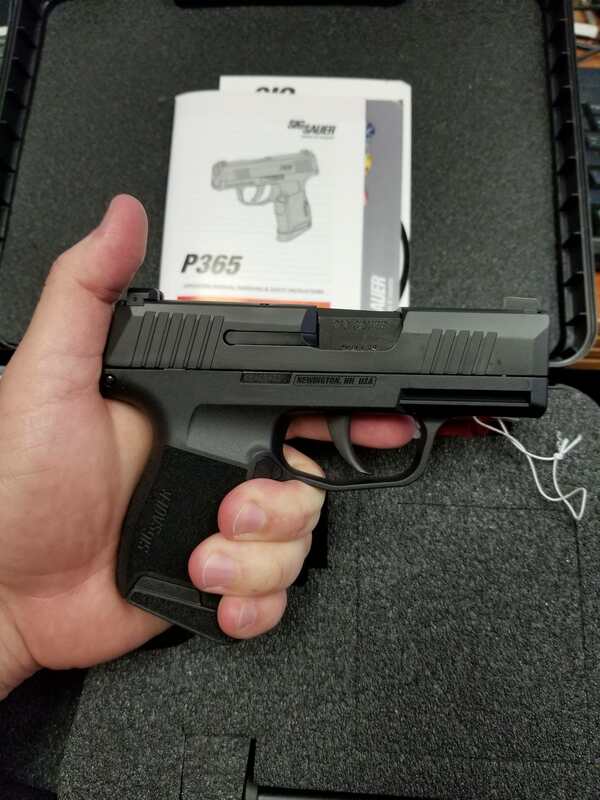 I'm a sig guy at heart though, and it shoots better for me so it was a no-brainer to get the 365. Any and all "bugs" have been worked out, and the gen 1 guns can't even be found for sale anymore, so don't believe anything bad you may hear about it. To fly is Heavenly, to hover is divine. Don't let your mouth write a check your a$$ can't cash. Going from a Glock to the shield. Wow, when you first feel that grip and how it fits the hand. I wanted a Glock 19 but I have small hands so it felt like I was holding a 2x4. I just picked up my new M&P 2.0 compact this morning. Same size as the Glock but feels great in my hand. Got a smoking deal on it used also but it arrived and was practically brand new. Just ordered the S&W M&P 2.0 40 for 299. Funny note I was in your area 3 weeks ago. Port Wentworth visiting a friend of mine to celebrate my 40th. Ruger LCP with a pocket knife style screw-on clip. I throw it in my front pocket on the clip if wearing a top that is not tucked in. If not, I don't use the clip and drop it in my pocket. The trigger pull is hideous, but that is really the only safety on the gun. I bought a used one for $300 when they first came out, but now you can buy them brand new for less than $200 with an "enhanced trigger". It is the size of a cell phone and fits my hands well. Crimson Trace and others make nice molded lasers for them that blend in smoothly with the front of the trigger guard (much like the Bodyguard). I will not carry something that I cannot conceal and having a .380 in your pocket is better than a .45 at the house. The weight and profile is AMAZING. I'm very happy carrying my Para Ordnance Expert Carry 1911 45 ACP. Same size as a Colt Defender. Sports an alloy full size frame, and a 4lb trigger out of the box. Shoots amazingly accurate for a 3.5 inch barrel. Paired with an Alien Gear IWB holster for summer and an OWB for winter carry. PROBLEM SOLVED. PROBLEM STAYING SOLVED! Kahn P45 with IWB. I like the Kahr due to the bigger grip than most carry pistols. I don't like having my pinky finger hanging off the bottom. I was strongly considering the Kimber pro carry line as it is 28oz and slightly smaller. I don't have much trouble with a full size 1911 5 inch barrel but mine loaded tips the scales at 43.8 ounces and that gets old after a while. I can't imagine walking around with a $1K, two-pound 1911. I have several and love to shoot them, but there is no way I would carry one especially trying to conceal it. I also have a Glock 26 and 27 that have never left the safe. The grips are so short they are uncomfortable as hell to shoot. They are fat and carrying them around is like having a can of Spam filled with lead in your waste band. This is what I carry in a Galco Miami Classic Shoulder rig. When I first started carrying it was a fn 5.7 but it's kinda big so now my carry is a glock 43 or my fn9c. Love my P365. Sold my Shield 9 2.0 because it just didn't feel as good as the P365 though I like the trigger on the Shield more. Too bad you didnt get KIA ###got. XDM 3.8 compact 9mil. 13+1 and fully loaded weighs in at 33.5 oz. Great shooter too !! BadAndy and Grannytrucker like this. NEVER do business with Sam Rivera AKA Sam Wilson. I actually rented that gun today and shot it against my Shield. I shot the P365, FN5 something( I can’t remember) and a Ruger SR9C and glock 43. On a side note. Any other weird lefty-long-gun, but righty-hand gun shooters? I mua e na poki'i! A inu i ka wai 'awa'awa! 'A'ohe hope e ho'i mai ai. I've had a Glock 27 for a long time.. I have a Kydex IWB Holster, but I'd like to get something a bit more comfortable, something on the outside. I'd also like to get a G23 or G19.. Might as well cuz I have a full size and the sub compact.